Here's the front of a brooch I made & enamelled for my mum's Christmas present. All I have to do next is make and attach the brooch finding for her. Thankfully I attended a course at MidCornwall Jewellery school where under the superb tuition of Linda Darty, Lisa Cain demo'd exactly how to do it! (well we learnt on earring studs but the techniques the same). The main secret to successful soldering of components onto enamel is to use a high melting point solder e.g. Hard Solder. This is because you need the enamel to flow on the opposite side (which avoids heat stressing the enamel and cracking it). Think of it like torch firing the enamel, with the added benefit of soldering something to the back. N.B. It's important that you don't get direct flame onto the enamel areas at it will blacken the glass and ruin your piece!!! 1) Prep the area to be soldered by burnishing and cleaning. 4) HEAT up the silver until the solder flows make sure everything is heated evenly and the metal is all red. 5) Move your findings quickly into position, remove the flame, continuing to hold them in position until the metal cools and the solder is hard (a second or so). 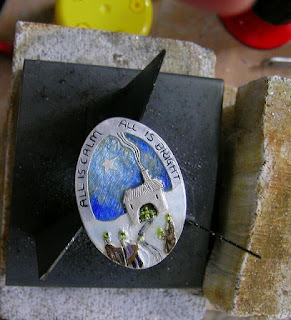 6) Let the silver cool down naturally & if using leaded enamels don't pickle or keep a very close eye on it. 7) If making a brooch then form the pins etc. You can find instructions for making your own brooch findings on my Murano Silver Blog. This is a picture of hubby picking out the winning ticket in my "Robert Dancik - Amulets and Talismans" book giveaway. He even did the paper opening (he said it made him feel like the draw master on the lottery). Congratulations Joy Funnell you're the lucky winner - email me your address & enjoy your early Christmas gift!